The more time we log covering the Cuse’ music scene, the more we experience a special spirit of collaboration recognition. Tonight musician and columnist Reggie Seigler (left), founder of JAMS (Syracuse’s Joined Artists Musicians and Singers’ ) presented a community award to Syracuse Jazz Fest Producer Frank Malfitano. The ceremony was during the intermission for the FunkFest 2K16 show. There’s a top 10 list somewhere as to why Frank Malfitano, producer, director, talent cultivator, and cultural savant “gets it” when it comes to showing pride for Syracuse and Central New York. Bringing Chief Lyons, the statesman, onto the stage at Jazz Fest tonight is high on that list. Respect. 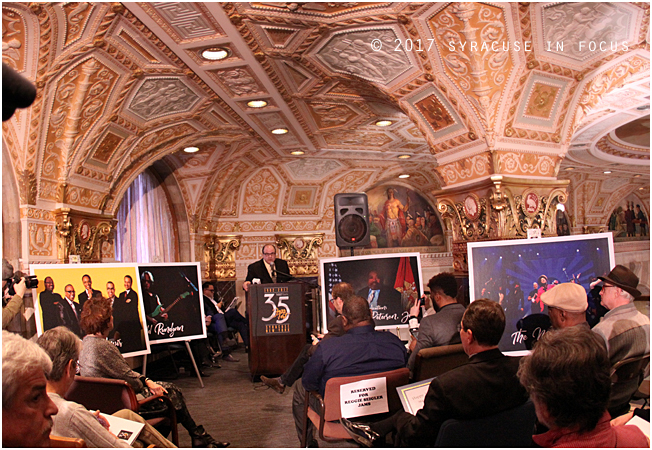 Syracuse Jazz Fest Producer Frank Malfitano announced the lineup at M&T Bank this morning. 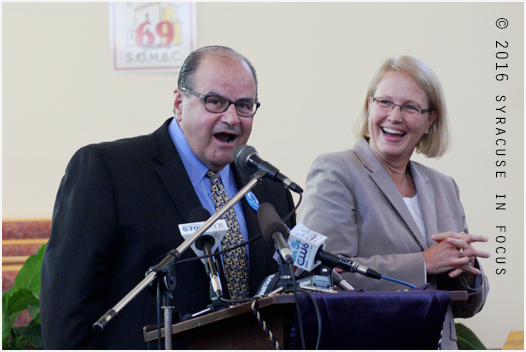 Pictured to the right is Jazz Journalists Association’s Susan Brink, who presented Malfitano with a 2016 National Jazz Hero Award. Sure we saw the lineup for this year’s Jazz Fest in the current issue of Downbeat already, but we still attended this mornings announcement at M&T Bank, because some things are better in person. Jazz Fest also puts together the best press kit for any music festival in the area. This year’s stellar lineup include a former Doobie (Michael McDonald), a Shorty (Troy Andrews) a Missy (Melissa Gardiner and her band Second Line Syracuse) as well as a tribute to a Murphy (Mark) and an artist-in-residence named Randy (Brecker). In addition, Groove Legacy, the Maverick’s and Notefied promise to make this another must see event. 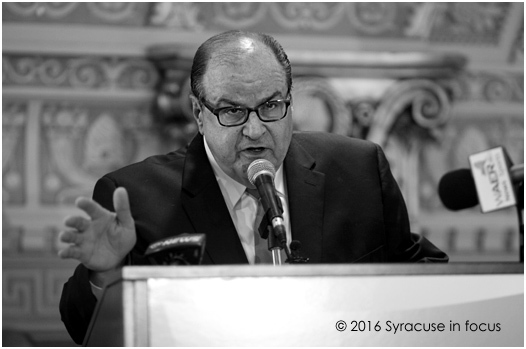 We also found out that the Mayor issued a proclamation naming today “Frank Malfitano Day” in Syracuse. 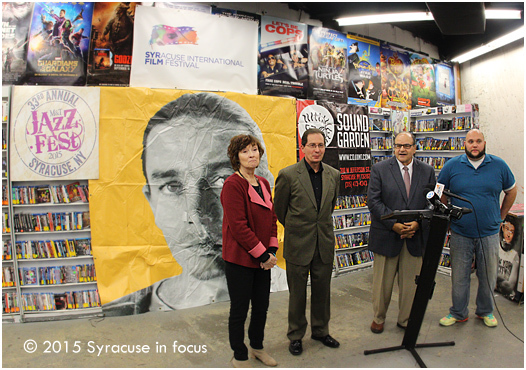 Christine Fawcett-Shapiro and Mike Massurin (Syracuse International Film Festival), along with Frank Malfitano (Syracuse Jazz Fest) and Eric Bush (General Manager of Sound Garden) announced that the DVD release and Northeast film premiere of Jaco will take place in Syracuse. A quartet of Syracuse arts groups, including The Place Theater, Syracuse Jazz Fest, The Syracuse International Film Festival and Sound Garden, held a press event today in Armory Square. The group will collaborate to host a premiere of Jaco, a documentary about bassist Jaco Pastorius. The film was produced by Robert Trujillo and directed by Paul Merchange and Stephen Kijak. Trujillo will make an appearance at the screening, which will take place at the Palace on Friday, November 27. Earlier in the day he will he will do a in-store DVD signing at The Sound Garden. 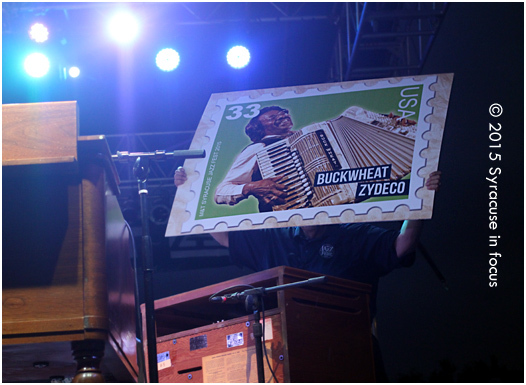 The 2007 Syracuse Jazz Fest was dedicated to Jaco Pastorius. 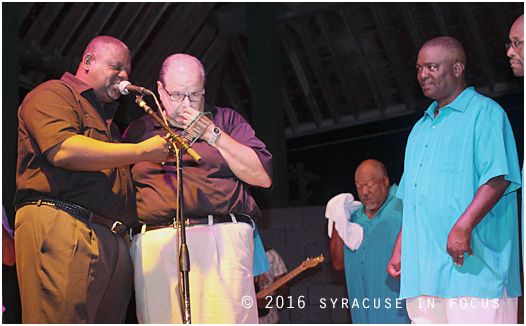 Syracuse Jazz Fest Producer Frank Malfitano tries to get the crowd to cheer on Buckwheat Zydeco to do one more encore last night. Free event + Premium content=Freemium. 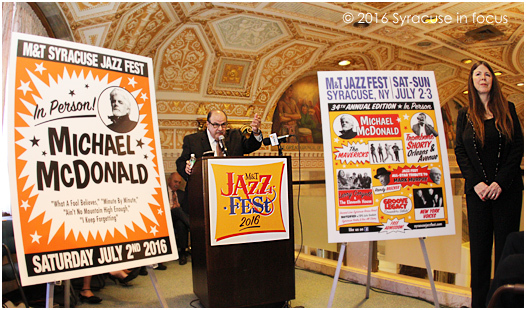 Bravo to Frank Malfitano for putting together what sounds like another great line up for Syracuse Jazz Fest. This year’s festival features Aretha Franklin, Wynton Marsalis, and Lake Street Drive. Once again the festival is free. The Friday night shows at Jazz Fest have become legendary (Trombone Shorty, Gregory Porter, Preservation Hall Jazz Band), and this year we are particularly interested in seeing the evening sizzle with a combination of Marsalis and Buckwheat Zydeco.